This past week was really great. We were able to baptize A woman named Mamiki Ngada, who was a referral from the ward. During the past few months she has been progressing very fast. When she bore her testimony at her baptism, i felt the spirit so strongly, confirming to me the Lord was indeed happy with this woman and needed her in his church. Our bishop gave us a goal and i have been trying to achieve it. He said “View your investigators filling some important calling in the church, like a Bishop or Relief society President. I promise you as you so this, you will baptize more faithful and powerful people.” Our Bishops Promise i believe will come true. I can easily see this woman being one of the spiritual leaders that we need in our church. I dont have much else to say this week, but just know i love you AND EXPECT TO HEAR FROM YOU EVERY WEEK!! Elders Payne and Agabu, with Mamiki Ngada, a newly-baptized member lady! 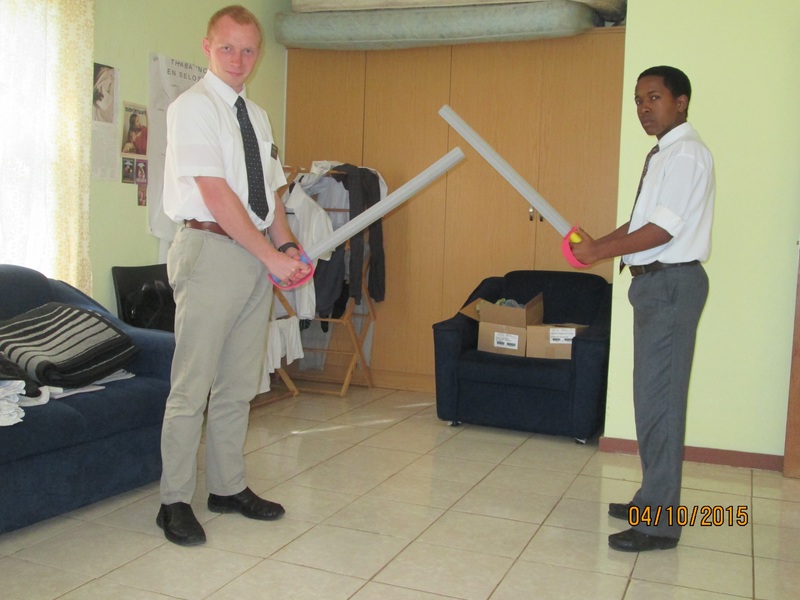 Elders Payne and Agabu having fun goofing off with foam swords!